Tagging along for the tour is Grave Digger, who in spite of having a career that is about five or six years longer than Blind Guardian’s, doesn’t pack the same luster over here in the States. In fact, this is the Germans’ first-ever full-scale North American tour, so you can’t find fault with those who were unfamiliar with the ragged voice of Chris Boltendahl, or the band’s battle-tested, simplistic old-school sound. Boltendahl still work the stage with the best of ‘em, getting the crowd all roused-up during “Headbanging Man,” “Witch Hunter,” and new cuts such “Season of the Witch” and “Tattooed Rider.” Gotta hand it to Boltendahl for having a sense of humor, too – the crowd, clearly unfamiliar with a lot of the band’s songs, didn’t exactly live up to his standards for sing-a-long participation, but the grey-haired frontman took it stride, even making something purposely sarcastic and/or silly faces. October 31 marked a special and unique celebration at the Worcester Palladium, as German power metal sensations Blind Guardian and Grave Digger rolled through town, leveling everything in their path like a panzer division from the homeland, and bringing with them tricks and treats for the metal masses that descended on the Palladium like a horde of Uruk-hai marching out of Mordor. It had been five years since the Bards returned to the United States, and much longer since Grave Digger made it across the Atlantic for a North American performance, never mind a proper tour. The last time I recall seeing the band was on board the 70,000 Tons of Metal Cruise in 2012 and that voyage did not include any performances on land. In an unusual twist, this show did not feature any opening bands, local or otherwise. With a plethora of local talent spanning the many subgenres of metal throughout New England, I’m sure there were a number of bands that could have benefited from the exposure that a tour like this would provide, however choosing to forgo openers on this run meant Blind Guardian was afforded more time to extend its setlist for the Halloween occasion and the band took full advantage of the opportunity to deliver a nearly two-and-a-half-hour performance that showcased 2015’s Beyond the Red Mirror as well as featured many classics from throughout the band’s rich discography. 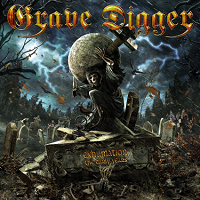 Grave Digger are touring in support of the recently released Exhumation – The Early Years, a 35th anniversary collection featuring re-recordings of the band’s early classics, three of which made it into the set. Reaching back to their 1984 debut, Heavy Metal Breakdown, Chris Boltendahl and the lads kicked things off with the opening cut “Headbanging Man” and immediately followed it with “The Round Table (Forever)” from Excalibur. Boltendahl is looking more like Gandalf these days, with his white mane, but he’s still brimming with energy, as evidenced by his signature ragged growl that boomed from the speakers and moving constantly about the stage, never staying in one place. Drummer Stefan Arnold kept things anchored nicely, while Jens Becker thundered away on bass and Axel Ritt laid down hammering riffs and melodic solos, and it wouldn’t be Grave Digger without the Reaper (Hans Peter Katzenburg) behind the keyboard. Boltendahl showed his years of experience commanding the stage, as he had great interaction with the crowd and continually riled the audience up, knowing they always had more to give behind their shouts, claps and cheers. As the band pounded away further into the set, the atmosphere inside the packed Palladium began to take on more of a European festival flavor with countless sing-alongs, claps, chants and Boltendahl trading vocal salvos with the audience, such as on “Ballad of a Hangman” and “Highland Farewell.” Seeing as how it was Halloween, “Witch Hunter” and “Season of the Witch” fit in perfectly among a set that balanced the old, such as “Excalibur,” with the new, such as “Tattooed Rider.” By the time the band reached “Rebellion (The Clans Are Marching),” the audience joined in with full throat and kept the heads banging and the fists flying for closer “Heavy Metal Breakdown.” Before they left the stage, band members tossed out Halloween candy to the crowd. Although Grave Digger only got to unleash a 10-song set, the band delivered a powerful and energetic performance that should convince promoters and fans alike the band has staying power in the U.S. and should plan on a return visit. 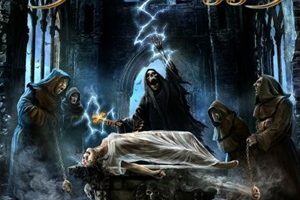 Before Blind Guardian took the stage, there were whispers in the crowd that the band had something special in store for Halloween. After Hansi didn’t join Grave Digger on stage for “Rebellion,” it was anyone’s guess what the band had planned. The first surprise of the night came when Blind Guardian took the stage, which they did in full costume. Portraying Elvis, the King himself, Hansi Kürsch wore a flashy white jumpsuit and a black hair wig and sideburns, while the rest of the band sported matching jester outfits, complete with pointed hoods, and skeleton masks. They opened with “The Ninth Wave,” but it was the second song, “Banish from Sanctuary,” that caused the pit to erupt in the middle of the floor, sending bodies slamming and beer spilling or flying in every direction. The frenzy continued as “Nightfall,” “Fly” and “Tanelorn (Into the Void)” followed. 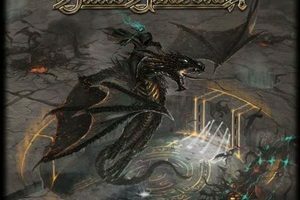 When it comes to power metal, there are few who can match Hansi’s golden voice; with equal parts grit and power, it soars over the audience while guitarists André Olbrick and Marcus Siepen deliver playful melodies, in the case of “Prophesies” and “Lord of the Rings,” or intense riffing on “Majesty” and “Lost in the Twilight Hall.” Hansi wasn’t the only one getting a vocal workout, as the audience was heavily involved in sing-alongs throughout the night, especially the extended “somebody’s out there” section on “The Last Candle” and the chorus on “Valhalla,” which was also stretched out for many repetitions to great effect. “Imaginations from the Other Side” closed out the proper set. “Sacred Worlds” kicked off the first encore, as the band returned to the stage, followed by “Twilight of the Gods” and “Valhalla.” However, the second encore is where the treats were unveiled. Starting off with a recorded version of “War of Wrath,” the band launched into “Into the Storm” and then came “Wizard’s Crown,” a special selection for Halloween. 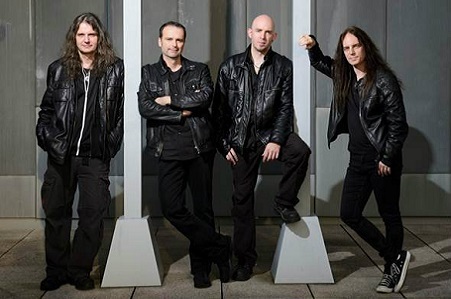 “You’ll have to provide most of the vocals for this next one,” Hansi said, as André and Marcus donned acoustic guitars in preparation for crowd sing-along favorite “The Bard’s Song – In the Forest,” which was followed by set closer “Mirror, Mirror.” At that point, everyone thought the show was over, but Blind Guardian wasn’t finished. “How about one more song for Halloween?” No sooner had Hansi finished the question, then three roadies dressed as women took the stage and the band launched into “Barbara Ann” for one final sing-along with the crowd.